Congratulations. We offer complete Wedding Villa packages & planning. European style 6 bedroom villa, located close to Chaweng, large indoor and outdoor stylish social spaces, a relaxing and peaceful getaway for groups & families. 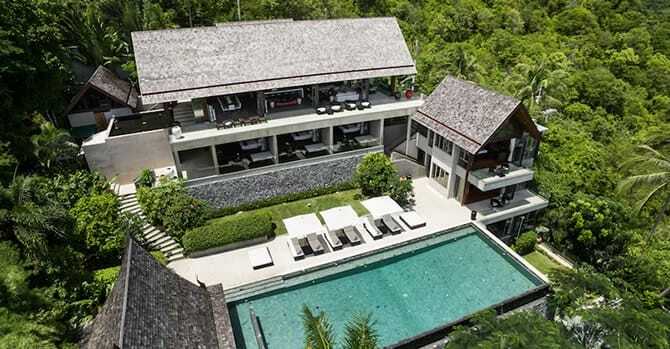 Luxury 6 Bedroom Villa Suralai has spectacular sea views over Bophut Bay, Cheong Mon and Koh Phangan. Luxury 5 bedroom beachfront Villa Haineu is a perfect tropical holiday retreat on the sea near Nathon. Koh Samui. 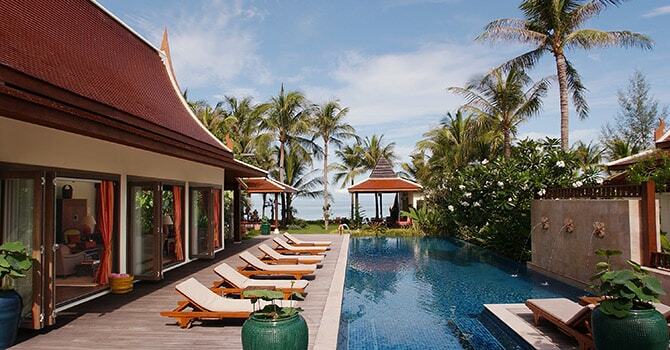 Luxury 5 bedroom beachfront Baan Rattana Thep is an exciting and exclusive paradise on the West coast of Koh Samui. Let us extend our deepest congratulations to you and your partner as you prepare for this exciting next stage in your life. We know that the time during an engagement, as you plan your dream wedding, is one of the most exciting times in your life, and we're delighted you're considering a Koh Samui wedding. Koh Samui is a stunning backdrop for your nuptials. The island is blessed with staggering natural beauty, and the kind and hospitable culture will also help make you feel that your day is enveloped with love and care. To discuss creating your Koh Samui villa wedding package, no obligation, feel free to CONTACT US. If you are considering a Koh Samui wedding, you may have already begun your search and received some information about differing packages and venues that are available. One well-known option for a Koh Samui wedding package is at a resort or hotel. 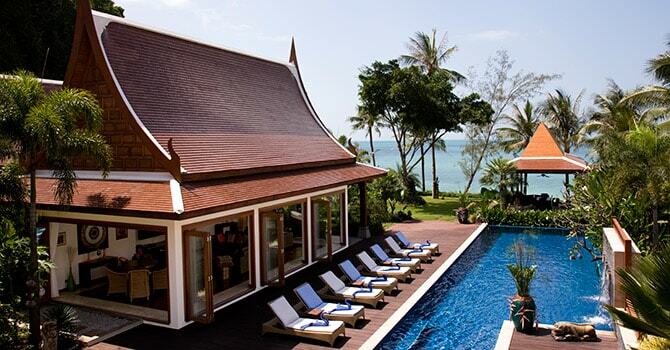 We believe that a Koh Samui villa in Thailand is a preferable choice for most couples. While often resort and hotel packages are impersonal and standardised, a luxury wedding villa experience is quite different. A wedding villa allows you to craft every aspect of your wedding, tailoring it exactly to your style and personality. We want you to have a wedding where you as a couple are reflected in every decision. There are so many different, yet equally beautiful, villas to go with your chosen theme. Villas range from charming and rustic traditional properties to ultra-chic sleek modern homes. Whatever you are dreaming for your big day, there is a property that suits. Likewise, our Koh Samui wedding villas are located all over the island, so whether your dream wedding is in a villa on the beach or in the jungle, there will be a wonderful choice. Another reason that villas are preferable to most couples is the wonderful privacy that comes with renting out an entire property. Your wedding day is a day to cherish together, just you as a couple with perhaps your most loved ones surrounding you. It can be distracting for there to be uninvited onlookers at the property. With a Koh Samui wedding villa, you will feel like you two are the only people on the world - as it should be! There is also a great deal of convenience with wedding villas. In the time before and after your wedding - as well as the wonderful day itself - you certainly want to minimise any worry so you can simply enjoy every moment of this wonderful time in your life. The convenience of a villa, with a small team of hospitable staff taking care of your day to day needs, and the ability to simply wander back to your beautiful Master Suite after the ceremony or reception, is another reason it is a wonderful choice for your wedding. The beauty of wedding villas and our Koh Samui wedding packages is that they are as unique and flexible as you are. It delights us to see what kind of ideas, themes and styles our couples choose for the most important day in their life; and we know that choosing the right Koh Samui wedding villa is a big part of that. 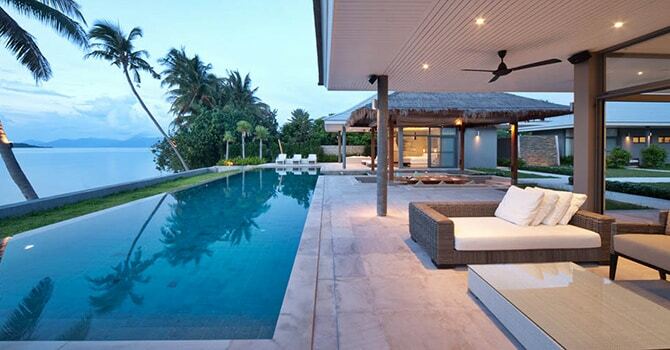 The first thing to consider when choosing a villa is the location. Do you dream of exchanging vows with the sea breeze in your hair and soft sand under your feet? Or is the idea of being high above the beach on a breathtaking seaview hilltop simply perfect? Maybe you have a more unique idea such as exchanging rings underwater, in wetsuits. Whatever your style and dreams for your wonderful day, there is sure to be a region of Koh Samui which fits perfectly. 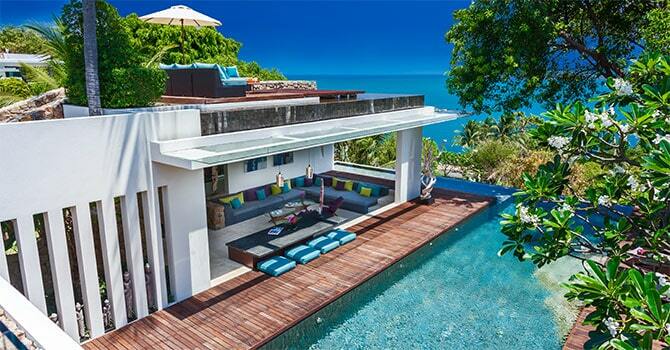 The second consideration is the villa itself. As the centrepiece of your big day, you want a villa that exactly reflects your unique style - whether it be a cozy and whimsical venue, or a grand and elegant home. You want a villa that fits your chosen theme, and fills your heart with happiness when you look at it. Another factor to think about is the size of your guest list, as this is likely to influence the property that you choose. Perhaps you are planning a romantic and intimate elopement with just you as a couple - a beautiful private moment shared between just you. Or, maybe you dream of beginning your marriage surrounded by the love and warmth of your extended family and friends. If so, you may also wish to consider whether you would like those guests to stay on the grounds of the villa, perhaps in standalone pavilions. A third and final consideration is staffing for your dream villa. All of our hand-picked luxury Koh Samui wedding villas have a team of staff who are on-hand to ensure all practicalities are taken care of; meaning you can simply sit back, relax and enjoy every moment of this wonderful time. You may also like to arrange for additional staff such as a full-time chef who can prepare delicious meals for you to share with your loved ones, or perhaps a babysitter to take care of the little ones while you prepare for the big day. Other options include the ultimate pampering experience, with wonderful beauticians, masseuses and spa therapists on call. You can either be pampered within the comfort of your villa, or perhaps head out to a luxurious spa for a rejuvenating and relaxing day. We know that the decision to choose a destination wedding can create some nerves, as you want to be sure that your dream day is exactly as you envisioned. This is why each of our Koh Samui wedding packages come with the services of an experienced and professional wedding planner who can assist and guide you through the process of bringing your dreams to life. Your personal wedding planner is your eyes, ears and feet on the ground to ensure that everything is in order and to act as a point of contact between you and those in Koh Samui. The relationship between you and your wedding planner will begin with a conversation about you as a couple, getting to know the story of your relationship and your visions for your special day. Your Koh Samui wedding planner can help you to make the big decisions such as theme and colour scheme, listening all the way to you and your visions. From here, your wedding planner can assist with choosing dream vendors. Each wedding planner has intimate knowledge of our luxury villas as well as all of the best wedding vendors in Koh Samui. This means that they can draw upon this knowledge to ensure that every vendor well and truly exceeds your expectations and will add beauty to your day. Throughout the process, you will have as much input as you desire, so that you can have all of the fun of planning every aspect of your wedding, while also having the security of knowing an experienced wedding professional is taking care of the practicalities. Our experienced wedding planners can also ensure that practical and legal requirements are quickly and simply taken care of. On the day, your wedding planner will be right by your side, ensuring that behind-the-scenes the day runs smoothly, so you only need soak in the incredible atmosphere and experience of the day and revel in the love between you and your partner. Part of the joy of a destination wedding is the option to fill the days and weeks in the leadup with wonderful events that will form part of your memories of your beautiful wedding. Our team has experience in tailoring all kinds of events, and it would be our pleasure to draw upon this experience to craft some additional experiences for you as a couple, and your wider guests. Perhaps you'd like to enjoy a sunset cruise with a glass of champagne in-hand? Retreat for a luxurious spa day with the rest of your wedding party? Or, maybe you'd like us to put together some fun and exciting festivities for your Bachelor or Bachelorette parties. We would be delighted to assist you to make the most of the other wonderful experiences that are available on the beautiful island of Koh Samui. How Much Does a Koh Samui Villa Wedding Cost? Each of our Koh Samui wedding packages are bespoke to you as a couple, so there is no set price. Instead, we offer great flexibility in terms of working with you and your budget. We appreciate that a budget is an important part of any wedding, and we can work with you on decisions such as which villa and suppliers to ensure that it is a price that you are comfortable with. Overall, our Koh Samui wedding packages offer excellent value for money, and generally present better value than other options such as hotels and resorts. We are honoured that you are considering sharing in your special day with us. To get an idea of the kinds of villas that could serve as the backdrop for your wedding, why not have a browse of our Koh Samui wedding villas? We also know that while planning a wedding is a joyful experience, the decisions can be overwhelming. We would love to discuss your plans on a no-obligations basis and talk to you about different options. Our team is available 24/7 to discuss your requirements. Please contact us today.